This is a ridiculously over-hyped ad for the Bally Home Library Computer, a fairly interesting if somewhat unsucsessful game console/home computer system. The $10,000 IBM 5100 computer they are constantly comparing it to was actually a full-on portable workstation with a keyboard, CRT, and tape drive that was capable of emulating an IBM mainframe. I am sure, however, that the Bally had better games. I don’t know if they ever actually deployed this system, but if they did it would be an impressively early and complete eCommerce system. This is the story of an incredible product. So incredible that we know of no future consumer product that will have such a far-reaching technological impact on society. The Bally Library Computer is a small console unit that resembles a programmable TV game but whose computing capabilities resemble that of the IBM 5100 currently selling for $10,000. This calculating power and its present and future programs will provide more convenience and benefits than any other recent electronic product. Imagine the computer as a printing calculator with ten separate memories. You enter the data on the unit’s keyboard, but instead of a paper tape, you use your TV screen to scroll out the answers similar to the credits on a movie screen. You can balance your checkbook and then double check your calculations by scrolling back to your first entry. By comparison, an electronic calculator with ten memories alone would cost what this entire computer costsâ€”but there’s much more. Your child inserts a cartridge in the Bally console. Three random math table problems are then flashed on your TV screen. Depending on the speed and accuracy with which those problems are answered, the Bally automatically programs the computer with your child’s math level. Problems in addition, subtraction, multiplication and division are then flashed on the screen for the next three minutes, and the computer continually adjusts to a level slightly better than the math level indicated by the previous three answers. The math tables, therefore, remain a challenge no matter how good your child becomes. Psychologists, who were consulted by Bally, helped design the cassette. They stated that the cassette should stimulate math learning and improve grades. On the same math cartridge is a two player game called Math Bingo. It adjusts to each player’s ability so a parent can play against a child or two children can compete against each other at their own math levelsâ€”both with an equal opportunity to win. You first answer a math table problem similar to the first exercise, and with a pistol-grip pointer you move a square on your TV screen to the correct answer position on your TV bingo card. The game involves both math skill and dexterity. Each game is totally different since the bingo cards have a million different possibilities. Scoring is constantly displayed, and a typical game lasts approximately three minutes. You can play as many consecutive games as you wish. However, to start the score over, you press the reset button. Picture nine baseball players running out on your TV screen to the sounds of “Take Me Out to the Ball Game” as you step up to bat. That’s the scene with Baseball, the arcade cartridge that plays two teams against each other with play so real that you hear all the music, sound effects and see all the action. There are walks, balls, and such realism that the pitcher covers first base when a ball is hit to right fieldâ€”just like the real game. There are double plays, walks and errorsâ€”all part of nine innings of Baseball. On the same cartridge are several paddle ball games but with a new twist. Players can move the paddle, not only up or down like most TV games, but sideways and diagonally. Other popular arcade games include, Sea Wolf, Red Barron, Tank and dozens of games only previously available at arcades. These same games cost arcade owners up to two thousand dollars each. Let’s quickly review the featuresâ€”an electronic printing calculator with ten memories, a teaching machine that adjusts to your child’s math level and an arcade center that replaces about $10,000 worth of electronic arcade games with just a few cartridges. Use any one of these features and you could justify buying this unitâ€”but there’s plenty more. With all its sophistication, the Bally Library Computer was designed to keep current with advancing computer technology no matter how sophisticated the development. Bally has provisions in its present system for expansion modules. These devices will permit you to: 1) draw directly on your TV screen with an electronic wand in 32 different colors and eight shades of each color, 2) compose, record and playback music on an electronic synthesizer, 3) record your personal belongings and their value for security purposes and add or delete items while keeping the list in tact, 4) record all your phone numbers and then use the system to dial those numbers on your telephone, 5) play chess on the phone with another player and be able to see a\ the moves on your TV screen. With these expansion modules, businessmen will be able to do all their bookkeeping functions, payroll, inventory control and billing. There will be printers, telephone modems and a variety of peripheral computer equipment that will turn your Bally Library Computer into a significant business tool. And, when used in your business, your Bally unit is depreciable like all your other capital equipment. Even large corporations can use the Bally for specific applications to avoid tying up their larger computer systems. The Bally Library Computer will turn these incredible add-on features into reality in a planned program starting now. Each month, a new cartridge or accessory expanding the unit’s capability will be announced. If you purchase your system from JS&A, you will be alerted to these new accessories by mail on a regular basis in advance of their availability and before any national announcement. You may then order the accessories directly. Each new cartridge or accessory will offer you a new way to use your system â€” a way that would justify, by itself, the purchase of the entire system. Don’t confuse the Bally Library Computer with the many inexpensive programmable TV games. The Bally computer is a powerful system using the Z80 microprocessor whose cost per byte (the measure of computer memory power) is even lower than a home computer. Yet it has 12,000 bytes of computer power in its most basic system and you are not just limited to teaching, music, entertainment or business applications. The Bally computer can be programmed to do anything any mini-computer can do. A programmable TV game at any price is (and will always be) just a programmable TV game. It cannot be expanded. The Bally Library Computer is actually a computer with a variety of expansion capabilities. This is the first time a full-scale computer has been offered to the consumer. The home hobbyist with his home computer started the revolution a few years ago. With the specific programs, software and accessories available from Bally, the age of affordable consumer computer ownership is here now. 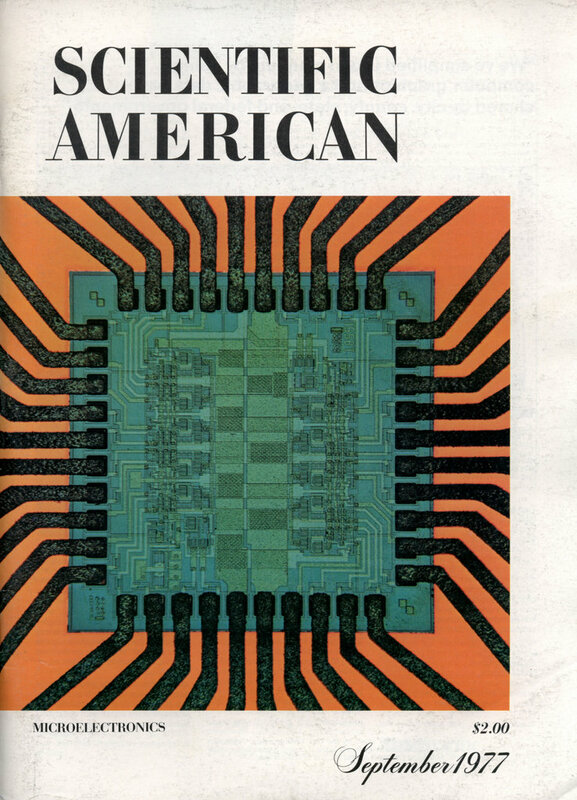 The computer you buy now has within its 34 integrated circuits an internal library of over forty tasks that it performs. With such an extensive internal library, your computing power is already in the unit you buy. This also means that the Bally unit is a smart computer. (There are such things as dumb computers.) A smart computer can complete a function faster and more efficiently because it depends less on the data it gets and more on what it can already do. The task library includes a built-in electronic timer which determines the end of a game or program by either score or elapsed time. It also times the arcade games and automatically turns off your unit and blanks out your screen if it is left on too long. Most TV set manufacturers have excluded sets that use TV games from warranty coverage because of the possible lines that appear on the screen from sets left on too long with the same picture. This is impossible with the Bally. If you get a phone call in the middle of a game, you press the pause control which lets you freeze the action right in the middle of a play and blanks out the screen so you won’t damage your picture tube. The library has sound effects so that each arcade game is completeâ€”from the sound of a baseball bat to that of a torpedo hitting a submarine. It has a math program capable of turning your unit into a scientific, statistical or engineering calculator with the addition of the appropriate cartridge. The library contains the capability of creating patterns on your TV screen, playing music, and accepting typewriter entries. It even has an index that displays everything in your library. The cassette cartridges add between eight to thirty-two thousand additional bytes of computer power to the basic 12,000 byte system. The pistol grip arcade accessory can be used to play all the arcade games. Its extensive internal library and the tremendous power in the computer are the big breakthroughs in the Bally unit. The internal computer has over 12,000 bytes with a minimum of 8,000 bytes in its cartridges. This puts more computer power in the hands of the consumer than six typical programmable TV games or an average hobbyist home computer. It has the computational capabilities of one $10,000 IBM 5100 computer, and each time you add a cassette cartridge you increase that capability. Good resolution on your TV screen is one of the end effects of so much computer power. By comparison, the best programmable TV game image is projected on a screen composed of 64 dots wide by 64 dots deep or 4,096 total dots. The Bally unit is 160 by 100 or 16,000 dots-four times moreâ€”so the Bally image is sharper and has finer detail, better resolution, smoother motion, and clearer letters for math or text applications. The most significant expansion accessory will be the $300 dual magnetic tape decks with an alpha numeric (typewriter) keyboard. With this accessory package, which will be introduced by JS&A in approximately six months, you can record data and software programs and do everything you can do on any mainframe computer system within the data storage capacity of the Bally unit. The implications of this add-on module are mind-boggling. First, it adds an additional 16,000 bytes of memory to the powerful 12,000 already in the basic system. Secondly, it provides not only more power and features than are presently available in any home computer, but it contains peripherals that would normally cost thousands of dollars extra and are considered accessories on all other mini-computer systems. Thirdly, it uses the computer basic language which is easy to understand. And finally, each cassette tape in the system will contain an additional one quarter million bytes of storage capability. With the tape decks and keyboard, the consumer will now own the equivalent of an entire computer system complete with peripherals, storage and memory. A high-speed 2200 characters per second printer will also be available next year. This will give you written records from your storage tapes. Store your most frequently called phone numbers, your income tax figures, your savings account deposits, the value of your stocks and bonds or a net worth statement. Then, when you need the information, press a button for a printed record. Our technicians have programmed JS&A’s main computer so you can use the Bally to access our computer directly when Bally’s dual tape decks become available. With a special module and cassette, you will be able to 1) call our computer on our toll-free number, 2) place an order, and 3) find out when it will be shipped. Since you communicate directly with our computer, your order is processed immediately and can be shipped within a few hours after receipt. To do this, JS&A engineers developed a $100 hardware ordering package that will be sent free to those customers who order the basic unit this year. When you order the Bally computer today, you are making an investment in the future. The basic unit you receive, without a single accessory, will provide more benefits than any other product of its kind in history. When you buy an expensive product, you must be absolutely satisified that you get the service and a solid company standing behind your purchase for many years to come. The Bally Library Computer is backed by a substantial company, Ballyâ€”in business since 1931 and now the world’s largest manufacturer of coin-operated amusement games. JS&A is America’s largest single source of space-age consumer products and also a substantial companyâ€”further assurance that your investment is well protected. 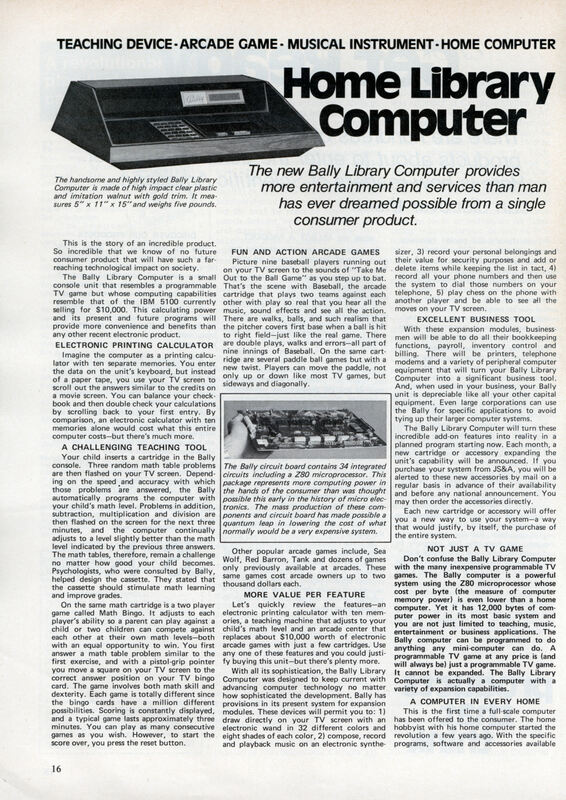 The Bally unit is a solid-state computer with its electronics condensed on 34 integrated circuitsâ€”all hermetically sealed and all pretested for a lifetime of service. The Bally Computer is also self-diagnostic. We have developed a cartridge that lets the unit itself check every integrated circuit and every solid-state component and which displays any malfunction on your TV screen. Then all you do is send the circuit board or your entire unit to Bally’s service-by-mail center for prompt replacement. The cartridge will be sent free-of-charge only to JS&A customers shortly after you receive your unit. Please don’t think service requirements are common. They’re not. But we wanted to assure you that service was such an important consideration in the Bally design that the unit practically repairs itself. Each unit comes complete with four pistol grips for use with the arcade and teaching games, an AC adapter (batteries are not required), three free arcade games, the calculator program, its internal library of tasks, complete easy-to-understand instructions and a one year parts and 90 day labor limited warranty-all for only $299.95. The arcade games include 1) Gun Fight, in which two cowboys shoot at each other around cactus, covered wagons and other obstacles, 2) Checkmate, a one to four player game in which you build walls around your opponent to win and, 3) Scribble, a one to four player game that utilizes the pistol grip to droodle different designs on your TV screen (in color, if you own a color set). A keyboard lets you use your printing memory calculator and a special scroll button lets you scan your entries up or down to review or check your calculations. You may also order with your unit the Baseball and Paddle Games cartridge for $24.95 or the Math Table/Math Bingo cartridge for $19.95. A bulletin will accompany your unit listing all the other cartridges and accessories that are available or will be available in the near future. We feel so positive about this product that we will 1) not charge you anything for postage and handling and 2) give you a 30 day extended trial period to prove that the Bally is everything you expected after reading this article. When you receive your unit, reconcile your checkbook with the calculator, let your child practice with the math programs or have your entire family play the arcade games. After you have used the system under your own conditions and have personally experienced its fun and benefits, then decide if you want to keep it. If not, return it within our 30 day extended trial period for a prompt and courteous refund. You can’t lose. Bally and JS&A have joined forces to mass market a product that will not only greatly influence the future of the computer industry, but will dramatically add consumer conveniences never before dreamed possible. Order your Bally Library Computer, at no obligation, today. Unit pending FCC approvalâ€”allow 4 weeks delivery.